This is just about the entire seating area. Some window seating and another small seating area is behind us. Seating: Not working with a ton of space it appears the lounge desiner’s visit to the furniture store was a short one. 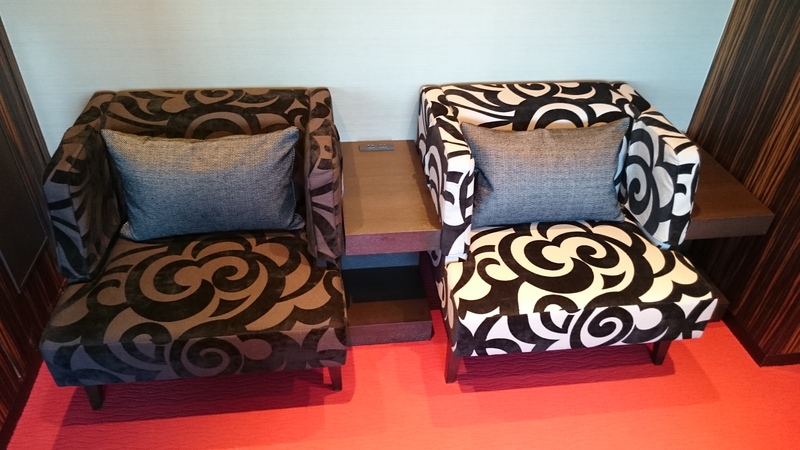 You’ll get either a comfy, deep lounge chair or one that’s better for your posture along the long counter looking out toward Haneda City and Mt. Fuji in the distance. If you’re tired of looking at planes from your lounge chair, it’s a refreshing change. 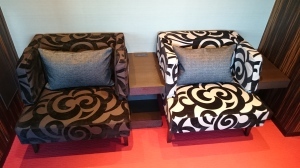 It’s not a huge lounge but seating is comfortable and in this sem-private corner you might be able to sneak a nap. Food/Drink: Eat first. 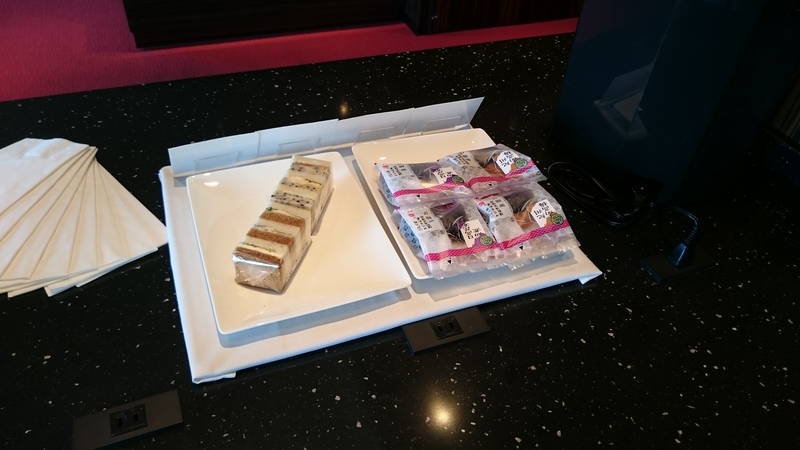 Tiny sandwiches and limited beverages are meant for passengers who’ve just used, or are about to use either one of THE Haneda’s “refresh suites” in the same space or their landside (pre-security) hotel. Wi-fi/Connectivity: Wi-fi is complimentary inside the transit lounge. This was verified by a call to the hotel after our visit but speed/reliability wasn’t tested on our short stay here. Service: The desk agent got us started with the bad news.With our stay on a premium floor at the landside hotel we were given a coupon for 1 hour inside a “refresh room” but not the ones attached to this lounge. The small suites are private and promise a comfortale spot to relax and shower before or after your flight. We were bummed but she warmly welcomed us to the lounge and made sure there were plenty of tiny sandwiches for us. This is it, the whole buffet. Luckily it’s all you can eat and they kept restocking it on our visit. Summary: It might not be fair to rate this alongside a more typical airline lounge because it’s not really advertised as one. Still, we’d like to see a more robust snack and drink offering. The real value might be in the private suites that we didn’t get to see complete with more plush seating and their own showers. Just the lounge? Meh. 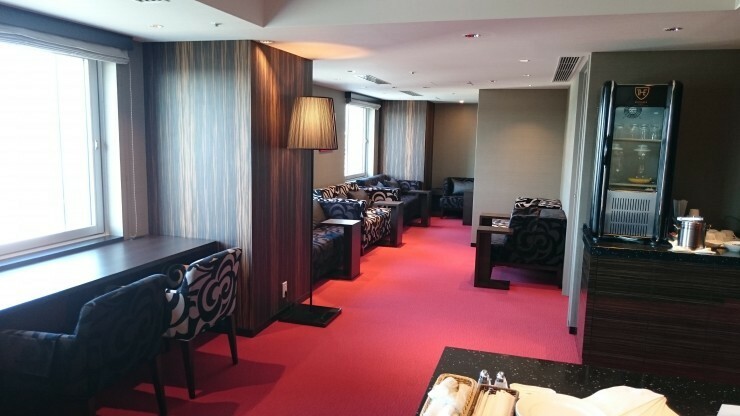 How to get in: Stay on a premium floor at The Royal Park Hotel THE Haneda landside at Haneda’s International Terminal or purchase an hourly stay in a “Refresh Room”.